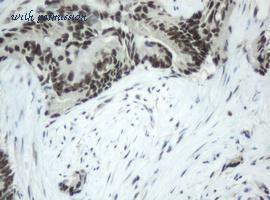 Immunohistochemistry analysis of paraffin-embedded human breast carcinoma, using c-Jun (Phospho-Ser63) Antibody. 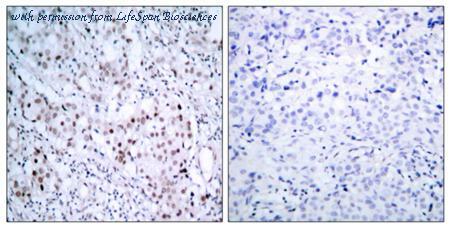 The picture on the right is blocked with the phospho peptide. 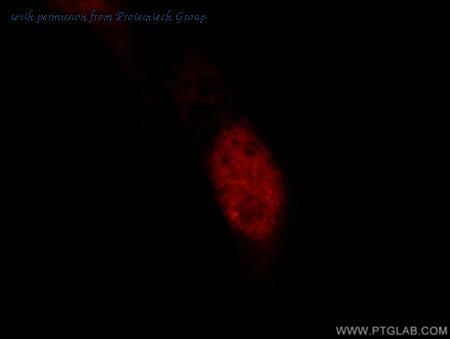 Western blot analysis of lysates from HeLa cells treated with UV, using c-Jun (Phospho-Ser63) Antibody. 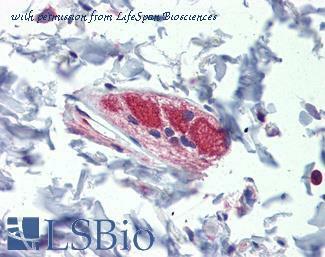 The lane on the right is blocked with the phospho peptide. 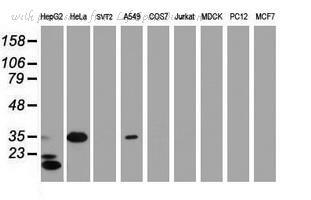 Western blot of extracts (35ug) from 9 different cell lines by using anti-JUN monoclonal antibody (HepG2: human; HeLa: human; SVT2: mouse; A549: human; COS7: monkey; Jurkat: human; MDCK: canine; PC12: rat; MCF7: human). 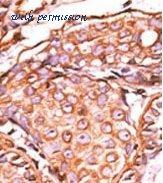 IHC of paraffin-embedded Adenocarcinoma of Human colon tissue using anti-JUN mouse monoclonal antibody. 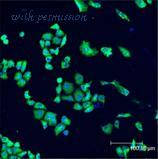 (Heat-induced epitope retrieval by 10mM citric buffer, pH6.0, 100C for 10min). 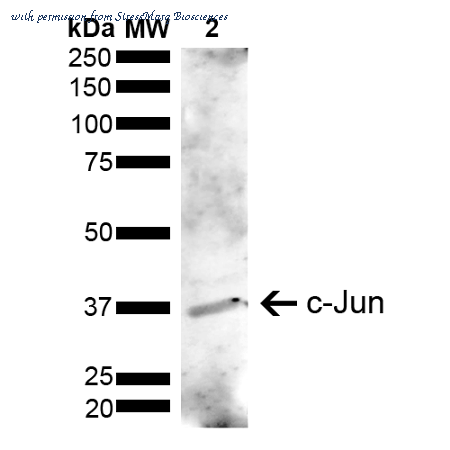 Western blot analysis of Human Cervical cancer cell line (HeLa) lysate showing detection of ~35.7 kDa c-Jun protein using Rabbit Anti-c-Jun Polyclonal Antibody (SPC-728). Lane 1: Molecular Weight Ladder (MW). 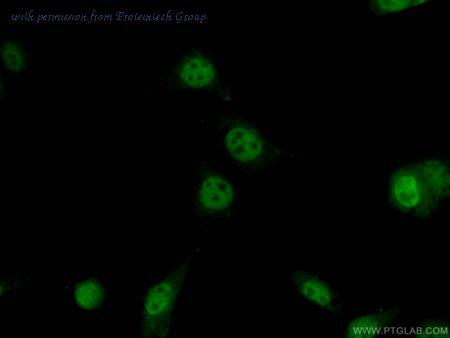 Lane 2: Cervical Cancer cell line (HeLa) lysate. Load: 10 µg. Block: 5% Skim Milk in 1X TBST. 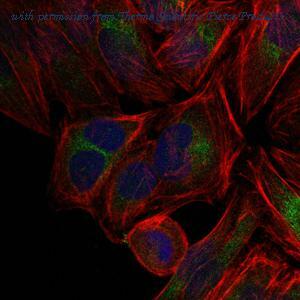 Primary Antibody: Rabbit Anti-c-Jun Polyclonal Antibody (SPC-728) at 1:1000 for 2 hours at RT. 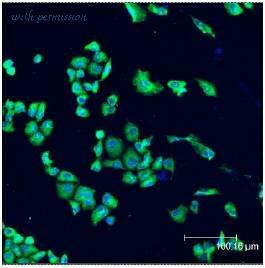 Secondary Antibody: Goat Anti-Rabbit HRP:IgG at 1:3000 for 1 hour at RT. Color Development: ECL solution for 5 min at RT. Predicted/Observed Size: ~35.7 kDa. Other Band(s): ~25 kDa potential degradation product. 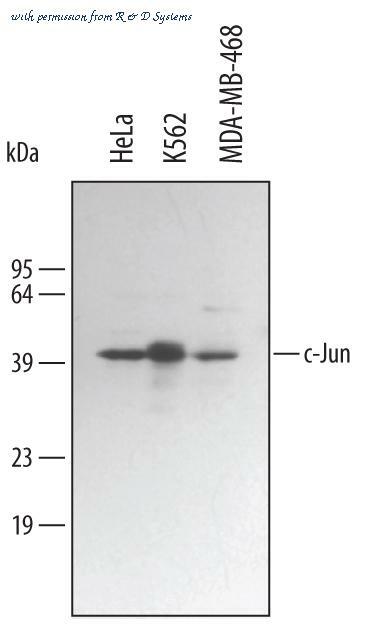 Western blot analysis of Human Cervical cancer cell line (HeLa) lysate showing detection of ~35.7 kDa c-Jun protein using Rabbit Anti-c-Jun Polyclonal Antibody (SPC-753). Lane 1: Molecular Weight Ladder (MW). Lane 2: HeLa. Load: 15 µg. Block: 5% Skim Milk in 1X TBST. 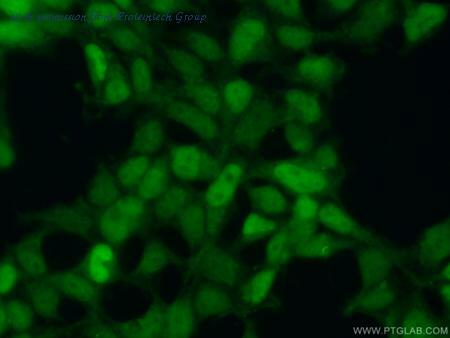 Primary Antibody: Rabbit Anti-c-Jun Polyclonal Antibody (SPC-753) at 1:1000 for 2 hours at RT. 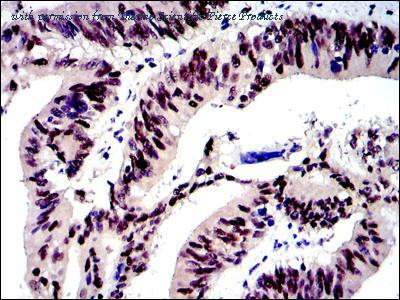 Secondary Antibody: Goat Anti-Rabbit IgG: HRP at 1:3000 for 1 hour at RT. Color Development: ECL solution for 5 min at RT. Predicted/Observed Size: ~35.7 kDa. 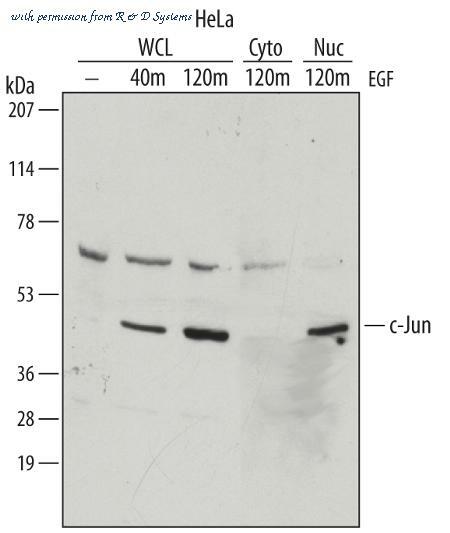 Detection of Human c-Jun by Western Blot. 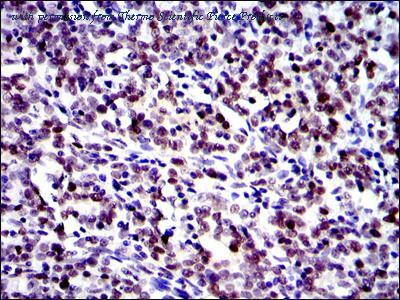 Western blot shows lysates of HeLa human cervical epithelial carcinoma cell line, K562 human chronic myelogenous leukemia cell line, and MDA-MB-468 human breast cancer cell lines. 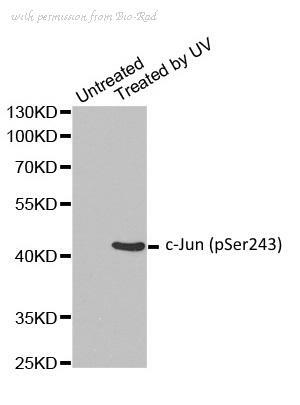 PVDF membrane was probed with 0.5 ╡g/mL of Sheep Anti-Human c-Jun Antigen Affinity-purified Polyclonal Antibody (Catalog # AF2670) followed by HRP-conjugated Anti-Sheep IgG Secondary Antibody (Catalog # HAF016 ). 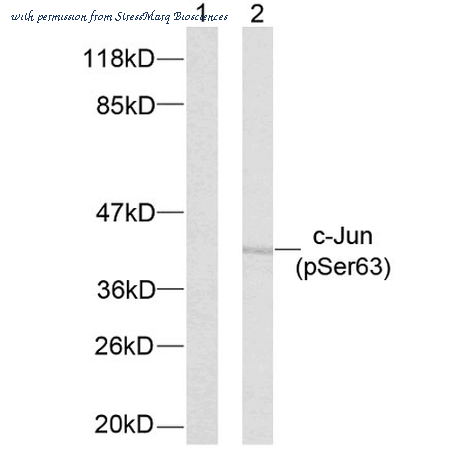 A specific band was detected for c-Jun at approximately 39 kDa (as indicated). 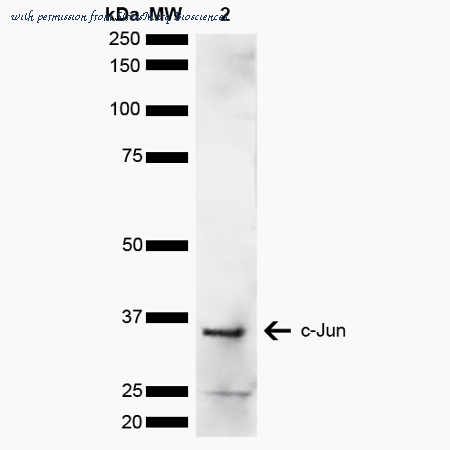 This experiment was conducted under reducing conditions and using Immunoblot Buffer Group 1 . 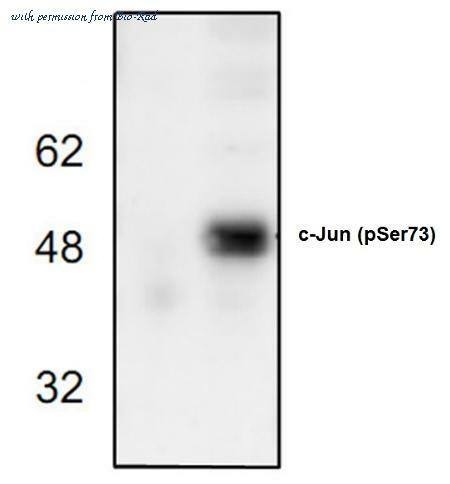 Detection of Human Phospho-c-Jun (S63) by Western Blot. 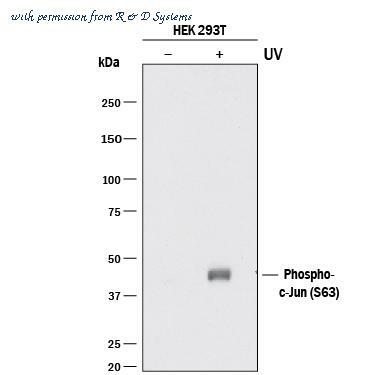 Western blot shows lysates of HEK293T human embryonic kidney cell line untreated (-) or treated (+) with 20 mJ/cm2 ultraviolet light (UV) with a 30 minute recovery. 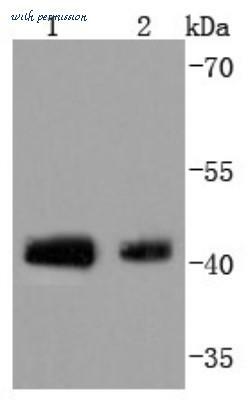 PVDF membrane was probed with 1:1000 dilution of Rabbit Anti-Human Phospho-c-Jun (S63) Monoclonal Antibody (Catalog # MAB8930) followed by HRP-conjugated Anti-Rabbit IgG Secondary Antibody (Catalog # HAF008 ). 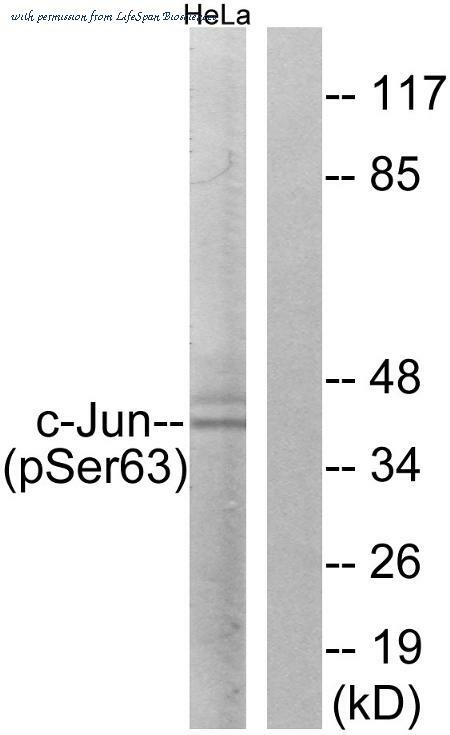 A specific band was detected for Phospho-c-Jun (S63) at approximately 45 kDa (as indicated). 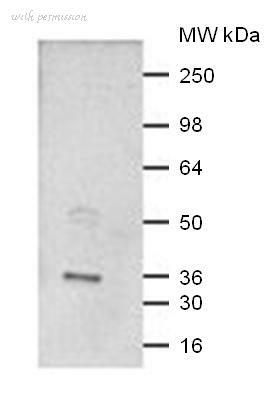 This experiment was conducted under reducing conditions and using Immunoblot Buffer Group 1 .